Technology: Conventional Machining Services are a range of metal cutting services that use traditional machining processes such as turning, milling, grinding, etc. to fashion parts from basic stock shapes such as bars, rods, etc. Conventional machining relies on machinists to control the feeds and speeds of the machine tools during the machining process usually using hand wheels, unlike CNC machining where computers control the motions of the machine tools. 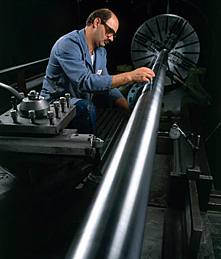 For making threads, the machinist will often use a lead screw built into the lathe to move the tool in relationship with the rotating work piece. Conventional machining processes are still used today by tool and die makers, hobbyists, etc. where the precision of machining is required but the necessity of programming CNC equipment is not. Advantages: Conventional Machining Services have been greatly supplanted by CNC machining, but cases still exist where conventional machining is preferred.